Each year, the Occupational Safety and Health Administration (OSHA) publishes a list of the ten most common violations it issues on construction sites. Last year’s top ten violations are the same as in 2015. In fact, despite the educational and safety materials that saturate the industry, the violations that make up the annual list are usually always the same. On average, 988 construction workers die on the job each year; around 3 million more get hurt. At The Korte Company, we think our workers are too important to put at risk. When we say we take safety seriously, we mean it. Our approach is simple: No cutting corners, no matter what. Listed below are the ten most common safety violations from 2016 and what you should do to avoid them. Fall protection – Contractors should first try to eliminate fall hazards altogether. This means doing as much work as possible from the safety of solid ground in advance before components are lifted and installed at height. This reduces the number of people put at risk of falling. If fall hazards can’t be eliminated, they need to be controlled. Preparatory meetings should inform workers of the identified hazards as well as the safety equipment recommended to control them. Only workers with proper fall prevention training should work at height. Hazard communication – Avoid hazard communication violations by creating, implementing and monitoring on-site hazard communication plans (HazComs). If projects include any dangerous chemicals or substances, all containers must be properly labeled and the substances’ safety data sheets (SDS) must be easily accessible. Workers must know the treatment procedures for exposure to any of the substances present on a site. Scaffolds – Planning is key. Any work that will require scaffolding should be mapped out well in advance in preparatory meetings. After plans are made, scaffolding should be installed, used, maintained and removed only under the direction of a competent person with the proper training. Authorized workers should be the only individuals working on scaffolds and must be trained to conduct their tasks safely while working at heights. Respiratory protection – In pre-planning, all respiratory hazards on a job must be identified. If they cannot be eliminated, they must be controlled. Written respiratory protection plans are required and must be readily available. Respiratory protection must only be used by workers after completing a medical qualification and an appropriate fit test. The protection should be rated and appropriate for the given hazard. Lockout / tagout – Whether the equipment involves electricity, compressed air, steam, heat, fire or something else, preparatory meetings should identify items with stored energy present on a job, what hazards the items pose and how to mitigate the hazards. Workers must be trained in verifying a “no-energy presence” for the equipment. Contractors can avoid accidents by restricting access to certain equipment to only those who are trained to operate it. Powered industrial trucks – With these vehicles, it’s about training. Only trained operators shall use this equipment. They need to know the equipment, be familiar with the manufacturer’s manual and always wear seatbelts and other safety equipment. Site managers should also restrict access to these vehicles to only those who are qualified to use it. Ladders – It’s simple: Users must inspect ladders prior to use. Never use ladders for tasks they’re not designed to perform. For instance, don’t lean step ladders against walls. Also, be aware of your footing. Never deploy a ladder on unstable or variable terrain. Machine guarding – This citation is issued when workers are observed using saws, grinders or other powered equipment without proper guards. If a tool comes with a guard, leave it in place. Operators should be familiar with the tool’s manual and only use it for manufacturer-recommended jobs. Operators can enhance their safety further by tying back long hair and not wearing baggy clothing while operating tools with moving parts. Electrical wiring and electrical, general requirements – These citations are similar, and avoiding them essentially amounts to making sure electrical wiring is installed properly. With temporary lighting or wiring, workers should ensure ground pins and outlets are functioning properly and that extension cords are free of nicks or cuts. All power outlets must include GFCI devices. Workers who have problems or questions regarding electrical wiring should consult trained electricians. Workers without the proper qualifications should never attempt to resolve electrical problems on their own. If you want to learn more about how you can take control of safety on your work sites, contact us. We’ll put you in touch with the experts we trust to keep our crews safe on jobs across the country. We also offer EM 385 Fall Protection training taught by Ric Foulks. 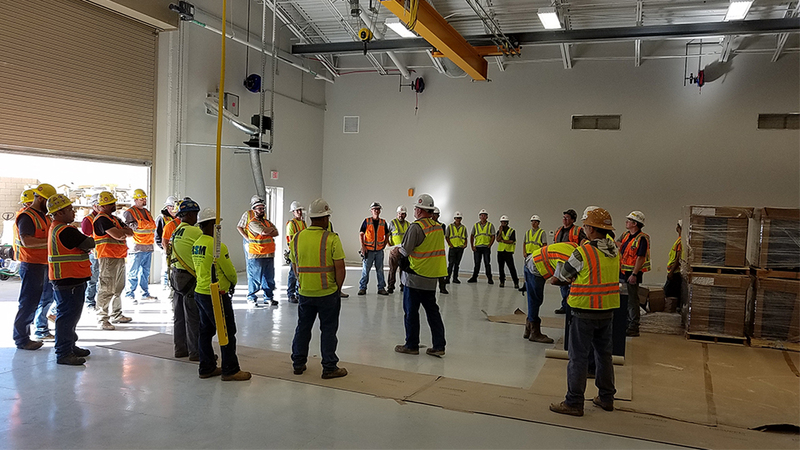 This training educates workers on the fall protection standards that cover military and other public sector construction. To get more information about the course and find out how soon you can enroll, fill out the form below.